Recently I've been doing some articles aimed at the beginner affiliate – like how you can avoid affiliate marketing scams and how you can find reputable affiliate programs to promote. The infographic above is available in high quality poster format via Zazzle for $27. All proceeds from the poster sales go to the Stroke Walk to help fight childhood stroke. Get it now! Now that you know what affiliate marketing is, find out how you can take a stab at it. You should also sign up for my free newsletter here. Love the graphic! 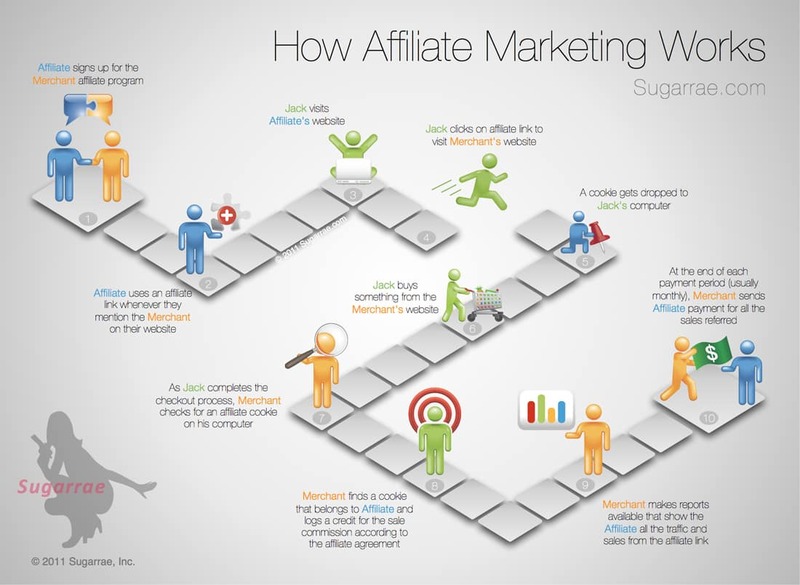 Haven’t seen a better explanation of how affiliate marketing works. I work at a digital marketing agency and not all my colleagues uderstand affiliate mkt fully (it will depend on the department they work in), so I printed it out and passed it around the office and shall be recommending your articles to them. Thanks! This is the first time to your site and I am delighted I found you. I am an article writer that has written so much about affiliate marketing, network marketing and all aspects of IM, I decided to start my own website to try and help those who are new to the business. I am definitely going to be using your network marketing diagram for my site and I will be back often! Thank you. i think that the biggest problem in affiliate marketing is that not many companies give really good accessories such as lead forms, buy now buttons ETC, that people can plant in their sites. The affiliate links usually cause a big drop in conversion rates. if more companies invested in their tools, i believe that it would come out as bigger income for both sides. meanwhile there are a few companies that even offer a white label which in my opinion is the most powerful way for the highest conversion rates. Hmmmmm….what a means of driving home the teaching, info-graphic indeed. You are a genius, keep it up. This was the best post on how affilliate marketeing is working! It will help me explaining it to my friends…. Many people have their systems set to not allow cookies…. How does that affect things? The number I’ve heard has always been closer to 30% overall (some browsers are higher, some lower) and this refers to THIRD party cookies. When a user sees your affiliate link and clicks on it, the cookie that is set is a FIRST party cookie, which is different. Love the image explain affiliate marketing Rae! I think I will take you up on it and make a post with that image in it. It’s good to understand how affiliate marketing works. Most people don’t realize that a lot of people actually make more money with this than with network marketing. great post / great explanation, but what I miss in the picture is the potentially involved BROKER or advertising company like clickbank/commission junction that also are often involved in the affiliate marketing process and usually take a commission in this whole affiliate marketing process. To me, the network is the same as software running an affiliate program in the above. Their just a method within the process – if that makes sense?